Some of the purported "swimmers" in the Cave of the Swimmers, Egypt. The generally-accepted explanation is that the climate was much wetter in the past, supporting not only the possibility of a swimming hole, but also abundant animal life, such as cows, giraffes and ostriches, which were also drawn or carved into the region's rocks. Rock art depicting a white cow. "Indeed, we found that there were lakes not far from the Cave of the Swimmers," says Chris McKay from the NASA Ames Research Center. Earlier this year, McKay and his colleagues h Center.he Cave of the Swimmers, a relatively recent, semi-permanent lake that could have served as a swimming hole carbonate deposits lining the walls of two neighboring valleys in the Gebel Uweinat region, which is about 200 kilometers south of the Cave of the Swimmers. "The deposits look like a 'bathtub ring' around the canyon walls," McKay says. The research at the prehistoric Journal of African Earth Sciences ouwas partly funded by the NASA Astrobiology Program. Giraffes and other animals not currently found in this part of the desert, which suggests the area was wetter in the past. The Cave of the Swimmers has captivated imaginations ever since it was discovered by the Hungarian explorer László Almásy in 1933. The shallow cave's paintings are about 7,000 years old, give or take a thousand years, and show human figures performing what looks like a kind of Neolithic doggy paddle. It should be noted that researchers now question the original interpretation of "swimming." "The 'swimmers' move towards 'headless beasts' in a straight line, more as if floating in air than swimming" says Andras Zboray, a Sahara explorer and rock art researcher. "They are clearly symbolic, as are the beasts, with an unknown meaning." "Both [of the newly-discovered] lakes are located in areas with an exceptionally rich concentration of rock art sites in the immediate vicinity, and I suspect this cannot be a coincidence," Zboray says. Uweinat is a mountainous area in the southwest of Egypt that is one of the driest places in the world. "Our scientific interest is the dry limit of photosynthesis, so we wanted to go to the driest part of the Sahara," McKay says. "The size of the lakes would probably have been large enough to do laps," McKay says. Some of the carbonate deposits discovered in Gebel Uweinat. "The obtained dates are surprisingly old, and appear to considerably pre-date the bulk of the rock art," Zboray says. 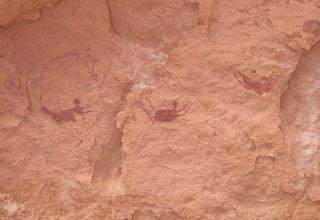 The caves in the surrounding area have abundant cattle paintings that are dated as 6,500 to 5,500 years old. "So there is a clear temporal disconnect," he says. "One plausible explanation is that the lakes were fed by some artesian source that could keep them at the same level for an extended time period, only limited by the height of the barrier blocking the valley," Zboray says. More carbonate deposits from Gebel Uweinat. "The carbonate is a macroscopic remnant of microscopic life," McKay explains. These biologically-triggered formations, or "microbialites," are found around the world at places such as Pavilion Lake in Canada and Lake Alchichica in Mexico. Darlene Lim from NASA Ames agrees that the deposits found by McKay's group are similar to the microbialites she studies as the principal investigator for the Pavilion Lake Research Project. "We are not going to find dinosaur fossils on Mars," McKay says. "What I hope is that someday soon a human will be able to apply their training, knowledge, and instincts, to find their way to a discovery on Mars that mirrors what Marinova et al. found in the Gebel Uweinat region," Lim says.